The foundation to a healthy home is the crawl space. Most of us avoid going into our crawl spaces at all costs; consequently, finding out your crawl space is moldy comes as a bit of a shock. When people are making a list of home improvements, spending money on the crawl space is seldom on anyone’s list. Yet, having a healthy crawl space is imperative. 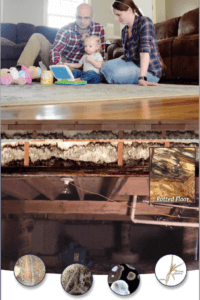 Why is a healthy crawl space important? Because anything that is in the crawl space is eventually coming into the living space of the home. Because excess moisture and mold can do serious damage to a home. Because none of us want to put our families through preventable sickness. There are many species of mold, and different people react differently to different species of mold. A couple species can be fatal to anyone especially if you are exposed on a long-term basis. Most species of mold, at the very least, cause different levels of respiratory issues. Improperly mitigated water loss. After a water loss, the inside living space was dried; but the crawl space was never dried. Over time, the standing water caused the wet substructure to mold. Downspouts or guttering in your home are dumping water next to the foundation. Landscaping or the slope of the yard are channeling water directly into the foundation. Your home’s crawl space lacks a vapor barrier to hold back the naturally occurring moisture in the soil underneath the house. Wet wants to go to dry, and the moisture in the soil will naturally want to move to dry wood. Pipes leaking underneath the house. What can be done to give me a healthy crawl space/home again? First, your crawl space must be dried. 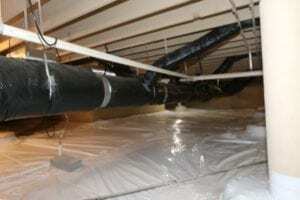 This requires the use of an indirect-fired furnace which pumps dry heat into the crawl space. The dry air is directed through crawl space. Wet wants to go to dry, so the moisture in the crawl space is attracted to the dry air and the now moisture-laden air is vented out of the crawl space. Once the crawl space is dried, the mold must be removed. This requires using either a chemical releasing agent made of hydrogen peroxide or media blasting with ice, soda, walnut shells, etc. 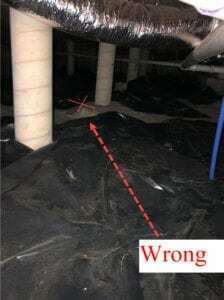 Third, the entire crawl space must be HEPA vacuumed (HEPA filtration is 99.7 microns), and all the debris must be removed from underneath the house. It’s very common to find old discarded pipe, duct work, lumber, large rocks, and other trash in a crawl space. Fourth, sealing the wood framing prevents mold from beginning to grow again and is imperative for the healthy crawl space. The final step is to add a 10-mil vapor barrier to seal out the ground moisture.A vapor barrier must cover the entire crawl space and be sealed with at least a 3-foot overlap between sections of plastic. All pilon supports must be wrapped with at least three feet of overlap at any seam. The plastic needs to be cut at the stem wall which allows the barrier to breath only at the base of the stem wall. 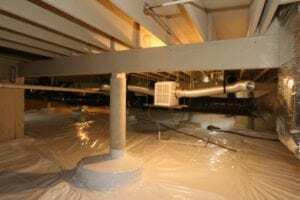 The average crawl space will take 5-8 days from start to finish to completely renovate. Fully mitigated crawl space that has been sealed and has a properly installed 10mil vapor barrier. In addition, this crawl space also has a humidistat controlled dehumidifier. 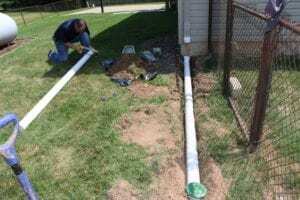 Installation of PVC drain to drain downspout away from foundation and crawl space. The recommendation for a downspout drain is 10ft from the foundation. You can see the gap in plastic not covering the entire crawl space floor. A properly installed vapor barrier should cover all the exposed dirt and gravel, and all seams should have at least a 3 ft overlap or be taped. You can see the sagging of the ductwork, where water is collecting. 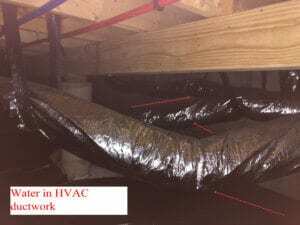 This ductwork must be replaced to avoid excessive moisture entering the house.